Gail and I met while attending the Kansas City Art Institute where I majored in Painting and Gail majored in Industrial Design. We both minored in Ceramics with Ken Ferguson and pottery became our love. In 1978 our talents were put to use when we founded River Hill Pottery. Over the past twenty years our interest has shifted from wheel throwing to hand building. Using coils to lattice developed into weaving the coiled pieces. 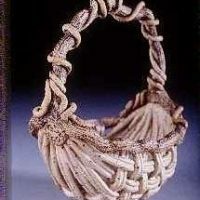 The first coils were hand rolled individually, but as the experience of weaving the clay developed the focus shifted. We began working with extruded clay which gave us the opportunity to create our own dies and spend more time with weaving patterns. Developing molds that we could weave over, has led us to the forms and shapes we now use. 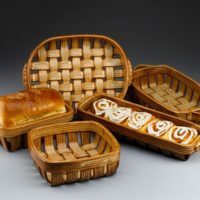 Not only are or baskets unique to look at but you can also bake in many of the shapes. The open weave has people wondering, but it works and looks great. Phil’s signature series and Gail’s minatures are one of a kind pieces that have unique extrusions and weaving patterns. These limited baskets are signed and dated. 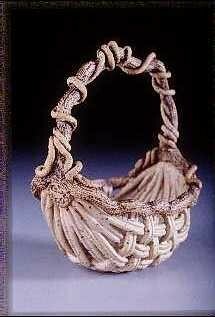 As the demand for our woven baskets has grown so has River Hill Pottery. 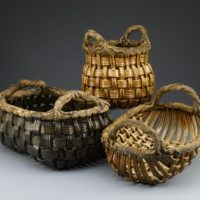 Today our woven baskets can be found in numerous shops And galleries around the country. 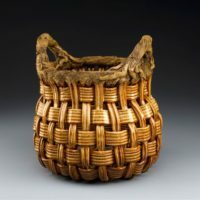 Phil’s signaturebaskets have been published in Handbuilt Ceramics by Kathy Triplett, Extruded Ceramics by Diana Pancioli, Ceramic Extruding by Tom @ Jean Latka and 500 Baskets by Lark Books.